Prominent French actor Gerard Depardieu received a Russian passport at a meeting with President Vladimir Putin in Sochi. While some pundits see this move as controversial, others regard it as positive sign that may spur a mass migration of rich Europeans to Russia. Although Gerard Depardieu received a Russian passport – and, thereby, Russian citizenship – after his meeting with President Vladimir Putin, and although this might contribute to creating a positive image of the country, Russians may regard this move as morally challenging and controversial, according to some experts. Meanwhile, others argue that Depardieu's decision may prompt a mass migration of rich Europeans to Russia. Putin had a brief meeting with Gerard Depardieu when the French actor paid a private visit to Russia. The actor received a Russian passport in the Black Sea resort of Sochi, where he met with Putin, said presidential spokesman Dmitry Peskov on Jan. 6. “Depardieu has received the Russian passport,” Peskov said in confirmation. During the meeting, Putin and Depardieu discussed a film about Grigory Rasputin in Russia, in which Depardieu played Rasputin. Earlier, the Kremlin press office had reported that Putin signed a decree to grant Depardieu Russian citizenship. The iconic French actor was happy to be granted Russian citizenship: Depardieu said that he loves Russia and promised to learn Russian and settle a few miles away from Moscow, in the countryside. Depardieu had recently renounced his French citizenship and moved to the Belgian border town of Nechin. His decision to settle in Belgium came before the country’s Socialist-led government enacted a plan to impose a 75 percent tax rate on annual earnings above $1.3 million. By comparison, Russia has a fixed, 13 percent income tax. France’s highest court later rejected the controversial government proposal to impose a “super-tax” on the wealthy, deeming it discriminatory and therefore unconstitutional. Konstantin von Eggert, Russia's famous columnist for radio Kommersant and RIA Novosti, believes that Putin's decision to grant Russian citizenship to Depardieu "should fill Russians' hearts with pride." At the same time, Depardieu’s decision may divide Russians in their opinions, the columnist added. "While the majority will no doubt be glad to have a world famous actor as their compatriot, the minority have questions about Depardieu's integrity," Eggert said in his recent column for RIA Novosti. "The question lies, rather, on a purely moral plain," said Eggert. "A YouTube video shows him shouting in broken Russian ‘Glory to Ramzan!’ last autumn at a public celebration of the Chechen leader's birthday in the Chechen capital Grozny." 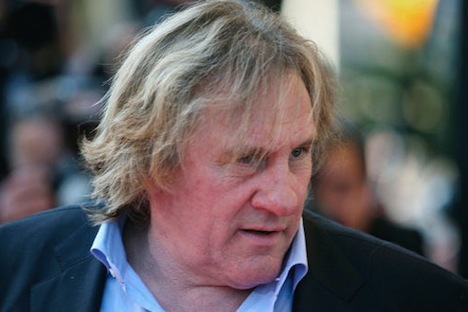 According to Eggert, Depardieu upsets public opinion. "His thank you letter to Vladimir Putin praises Russia for its ‘great democracy,’” Eggert said. "This has made many Russian intellectuals complain about the French actor's lack of moral scruples. The debate is characteristic for contemporary Russia, where in the past year issues of public personalities’ moral standing and reputation became particularly acute." "The string of Kremlin-sponsored laws limiting civil liberties and the recent ‘anti-Magnitsky law’ banning U.S. citizens from adopting Russian children have posed a lot of people with stark moral and political choices. "These choices now have consequences, including damage to personal relations on both sides of the political divide. Gerard Depardieu, if he decides to reside in Russia, may well find out soon what this means," said Eggert. Meanwhile, when asked about Depardieu's decision, Russia's Deputy Prime Minister, Dmitry Rogozin, had this to say: "The West is not well familiar with the peculiarities of our [Russan] tax system. When they learn it, we will expect a mass migration of rich Europeans to Russia." A renowned actress and animal rights campaigner, 77-year-old Bardot said that she will have to become Russian if the French authorities do not drop their plan to put down two sick elephants at a zoo in Lyon. The article is based on materials from RIA Novost and Vedomosti.